VOTE! - ASK. LEARN. VOTE! In Person at the municipal clerk's office up to 5 p.m. or the close of business whichever is later on the Friday before the election. At the Polling Place on Election Day. Are you a first time voter and want to register? Link here. On Election Day, polls are open from 7 a.m.-8 p.m. Note that you DO need to show ID to vote in next year's spring election! 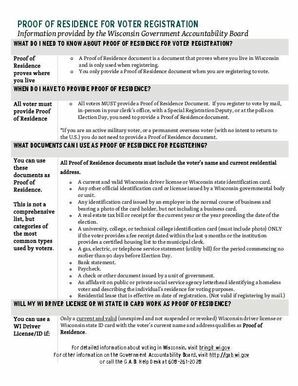 For additional information regarding the status of the voter photo ID law, please see the Voter Photo ID Law page. A current and complete residential address. A current and valid State of Wisconsin Driver License or State ID card. A university, college, or technical college identification card (must include photo) ONLY if the voter provides a fee receipt dated within the last 9 months or the institution provides a certified housing list, that indicates citizenship, to the municipal clerk. Residential lease that is effective on date of registration. (Not valid if registering by mail. 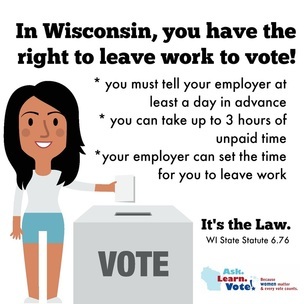 In Wisconsin, it's your right to leave work to vote! What you see on the sample ballot is exactly what you will see on Election Day. These ballots become available the closer we get to an election. Link here and see if your sample ballot is available. If you do not register to vote ahead of time, you can register to vote on Election Day at your polling place if you have lived at your current address for more than 28 days. Be sure to bring proof of residence with your current address such as your driver’s license or phone or utility bill, or residential lease (same process and requirements if you’ve changed your name or moved). If your name does not appear on the voter list at your polling place, you must complete a voter registration application before you will be allowed to vote. The Wisconsin Disability Vote Coalition has a toll-free hotline to call during business hours and polling hours on election days if voters with disabilities are experiencing any accessibility problems on election day: 1-800-928-8778 voice; 1-877-758-6049 TYY. If you can’t make it to the polls the day of the Elections, you can complete the Application for Absentee Ballot and mail to your municipal clerks’ office. Early voting will now begin the third Monday before an election and end at the close of business the Friday before the Election. For more information about early voting, click here. You can also vote early at your local municipal clerks’ office. Please check with your municipal clerk for regular office hours. ​For more information about early voting, click here.